Yesterday I blogged about the simplest and best Knowledge Management model - if you missed it, follow the link. This model is a process-based model, and is based on the flow of knowledge in and out of projects, and in and out of the tacit and explicit repositories (the Community of Practice, and the Knowledge Base respectively). One thing we can overlay on that, is the accountable roles for each component, and that is what I have done in the diagram shown here. The Owners (/custodians/Stewards) of the Knowledge Assets, represented in the picture by the woman in brown holding a pencil. We describe this role in our page on the Knowledge Owner role, and in my blog post on Process Ownership. There will be one Knowledge Owner for each important topic. The Leaders (/facilitators/moderators) of the Communities of Practice, represented in the picture by the man in blue holding a pencil. We describe this role in our page on Communities of Practice. There will be one Leader for each Community of Practice. The Knowledge Managers (/KM champion/Lesson Integrator) working in the teams and projects, represented in the picture by the man in a cap holding a spanner. We describe this role in our page on the Knowledge Manager role, and there are several example descriptions of this role in my blog posts tagged "Role". 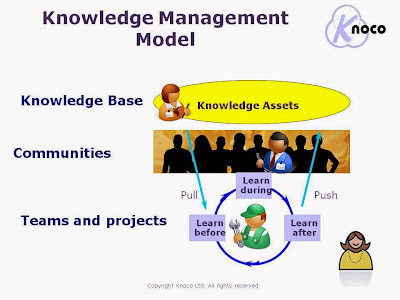 There will be one Knowledge Manager for each major department or major project. The Knowledge management team, represented in the picture by the woman with the necklace. We describe this role in our page on the Knowledge Management team roles, and there are several discussions of this role in my blog posts tagged "Role". There will be generally one Knowledge Management team, although in major multinationals there may be one per business stream.